Fully renovated gulf front High Pointe Resort Condo! 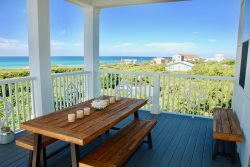 The Ideal 30A Gulf Front Vacation Condo! High Pointe is a private gated resort, nestled between Alys Beach and Rosemary Beach. Experience the exclusive shops, restaurants and events of Rosemary and Alys Beach all within a 5 minute walk. This tropical 15-acre paradise features five 4-story buildings, two of which are gulf front. The remaining three buildings are set around a family-friendly lagoon pool with graceful palms, tropical flowers and 6 cascading waterfalls. As the sun is setting, relax in the warm waters of the pool-side hot tub or enjoy the spectacular gulf front restaurant and bar with sweeping views of the Gulf. Stay in the most exclusive area of 30A at an affordable rate. High Pointe is very much a family destination where wonderful beach memories await! High Pointe offers vacationers the best of both worlds! 3) 2 bikes are included in the rental. To utilize, waiver must be signed and received before code provided. Please contact Saxon Smith with Bikes4U at 850.399.1230 with any bike questions.